G protein-coupled receptors (GPCRs) exhibit some level of basal signaling even in the absence of a bound agonist. This basal or constitutive signaling can have important pathophysiological roles. In the past few years, a number of high resolution crystal structures of GPCRs have been reported, including two crystal structures of constitutively active mutants (CAM) of the dim-light receptor, rhodopsin. The structural characterizations of CAMs are impeded by the lack of proper expression systems. The thromboxane A2 receptor (TP) is a GPCR that mediates vasoconstriction and promotes thrombosis in response to the binding of thromboxane. Here, we report on the expression and purification of a genetic variant and CAM in TP, namely A160T, using tetracycline-inducible HEK293S-TetR and HEK293S (GnTI¯)-TetR cell lines. 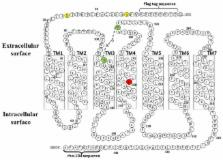 Expression of the TP and the A160T genes in these mammalian cell lines resulted in a 4-fold increase in expression to a level of 15.8 ±0.3 pmol of receptor/mg of membrane protein. The receptors expressed in the HEK293S (GnTI-)-TetR cell line showed homogeneous glycosylation. The functional yield of the receptors using a single step affinity purification was 45 µg/106 cells. Temperature- dependent secondary structure changes of the purified TP and A160T receptors were characterized using circular dichroism (CD) spectropolarimetry. The CD spectra shows that the loss of activity or thermal sensitivity that was previously observed for the A160T mutant, is not owing to large unfolding of the protein but rather to a more subtle effect. This is the first study to report on the successful high-level expression, purification, and biophysical characterization of a naturally occurring, diffusible ligand activated GPCR CAM. Structure and function in rhodopsin: high-level expression of rhodopsin with restricted and homogeneous N-glycosylation by a tetracycline-inducible N-acetylglucosaminyltransferase I-negative HEK293S stable mammalian cell line. An HEK293S cell line resistant to ricin was prepared by mutagenesis by using ethyl methanesulfonate. It was shown to lack N-acetylglucosaminyltransferase I (GnTI) activity, and consequently unable to synthesize complex N-glycans. The tetracycline-inducible opsin expression system was assembled into this GnTI(-) HEK293S cell line. Stable cell lines were isolated that gave tetracycline/sodium butyrate-inducible expression of the WT opsin gene at levels comparable with those observed in the parent tetracycline-inducible HEK293S cell line. Analysis of the N-glycan in rhodopsin expressed by the HEK293S GnTI(-) stable cell line showed it to be Man(5)GlcNAc(2). In a larger-scale expression experiment (1.1 liter) a WT opsin production level of 6 mg/liter was obtained. Further, the toxic constitutively active rhodopsin mutant, E113Q/E134Q/M257Y, previously shown to require inducible expression, has now been expressed in an HEK293S GNTI(-)-inducible cell line at levels comparable with those obtained with WT rhodopsin. The structural basis of agonist-induced activation in constitutively active rhodopsin. G-protein-coupled receptors (GPCRs) comprise the largest family of membrane proteins in the human genome and mediate cellular responses to an extensive array of hormones, neurotransmitters and sensory stimuli. Although some crystal structures have been determined for GPCRs, most are for modified forms, showing little basal activity, and are bound to inverse agonists or antagonists. Consequently, these structures correspond to receptors in their inactive states. The visual pigment rhodopsin is the only GPCR for which structures exist that are thought to be in the active state. However, these structures are for the apoprotein, or opsin, form that does not contain the agonist all-trans retinal. Here we present a crystal structure at a resolution of 3 Å for the constitutively active rhodopsin mutant Glu 113 Gln in complex with a peptide derived from the carboxy terminus of the α-subunit of the G protein transducin. The protein is in an active conformation that retains retinal in the binding pocket after photoactivation. Comparison with the structure of ground-state rhodopsin suggests how translocation of the retinal β-ionone ring leads to a rotation of transmembrane helix 6, which is the critical conformational change on activation. A key feature of this conformational change is a reorganization of water-mediated hydrogen-bond networks between the retinal-binding pocket and three of the most conserved GPCR sequence motifs. We thus show how an agonist ligand can activate its GPCR. Conceived and designed the experiments: BX RC JO RB PC. Performed the experiments: BX RC JO. Analyzed the data: BX RC ME SD JO SS RB PC. Contributed reagents/materials/analysis tools: JO. Wrote the manuscript: BX RC ME JO SS PC. This work was supported by a Discovery grant (RGPIN 356285) from the Natural Sciences and Engineering Research Council of Canada to PC, and an operating grants from the Manitoba Health Research Coucnil to PC, from the Heart and Stroke Foundation of Manitoba to RB and the National Institutes of Health (GM 41412) to SOS. An MMSF/MHRC Dr. F.W. DuVal Clinical Research Professorship to SD, a New Investigator Award from Heart and Stroke Foundation of Canada to PC, and a MICH/MHRC graduate studentship to RC. The funders had no role in study design, data collection and analysis, decision to publish, or preparation of the manuscript. HIV-1 protease variants from 100-fold drug resistant clinical isolates: expression, purification, and crystallization. Affinity purification reveals the association of WD40 protein constitutive photomorphogenic 1 with the hetero-oligomeric TCP-1 chaperonin complex in mammalian cells. High levels of MMP-1 expression in the absence of the 2G single nucleotide polymorphism is mediated by p38 and ERK1/2 mitogen-activated protein kinases in VMM5 melanoma cells.